Kale contains more of the good stuff per gram than milk (and although specifics on grams of calcium per 100g serving vary from site to site across the internet, just type kale vs milk calcium into google and you’ll see the battle is well documented but kale always wins). 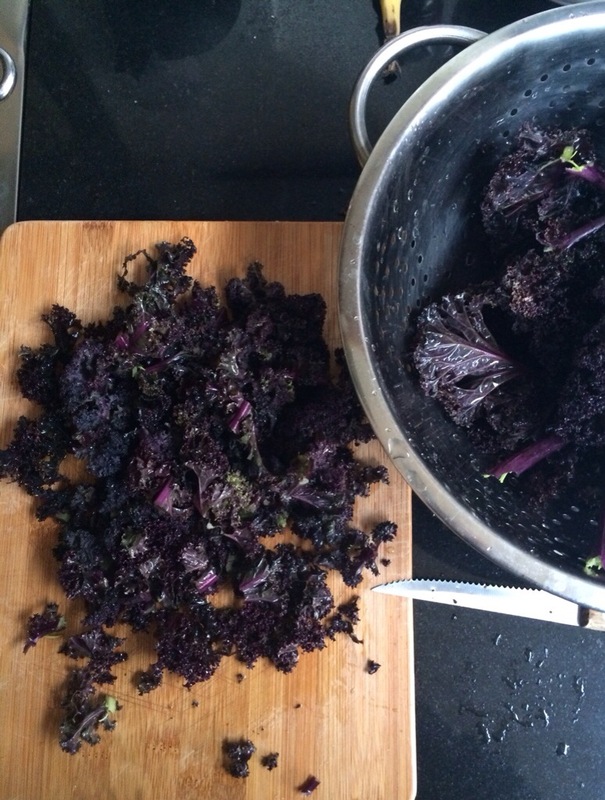 It’s a fact that still surprises many but what’s even more delicious than lovely, bold green kale is deep, dark and frilly purple kale. But the next question that everyone asks: How do you cook it? I’m not one for following recipes by the book and whenever I look up a recipe for a green leaf I’m always disappointed to find it’s just a sidekick – like adding Swiss chard to a soup and getting a few measly leaves as part of the deal. Lovely, but no thanks. So I generally do my own thing, cook up the whole bag and make it a dish in itself. Not only to get the full whammy of nutrients – iron, calcium, vitamin E (great for skin), vitamin K (great for bone health too), vitamin C (more than an orange), omega 3 and 6 (great for skin and joints) and magnesium (necessary for absorption of calcium) – but inevitably, if you just cook half with the intention of cooking the rest another day, that day never comes and that poor half-bag of kale just sits there in the fridge, wilting and getting old. So cook the whole bag and have the rest (if there is any!) for lunch the next day. 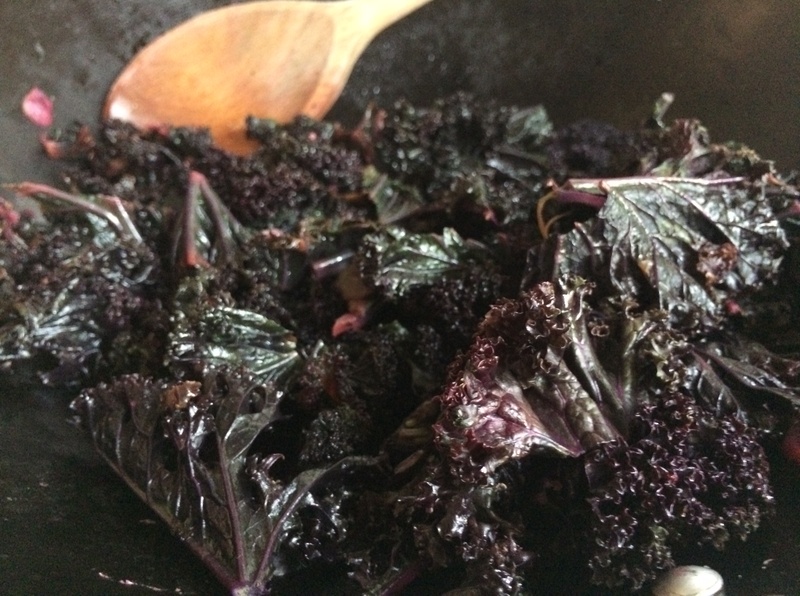 My current favourite way to cook kale is really very simple. I chop it as finely as you fancy, stalk and all (that part is actually very delicious cooked with a subtle sweet flavour), and add it to a pan with around 3 – 4 cloves of garlic (pressed lightly against a chopping board with the back of a knife). Then I cook for just a few minutes, just so the kale softens a little and the garlic infuses the leaves. More often than not, I’ll serve it like this, with salt/pepper seasoning, olive oil and half a lemon squeezed on top. Lemon is a never-to-be-missed addition to any green leaves dish as the vitamin C is essential to for iron absorption. Its alkalising properties also release enzymes for better digestion. For more flavouring, I love adding a tablespoon of Clearspring Organic Japanese Miso which melts down into consistency as thick or thin as you like, depending on how much water you mix it with (use hot water so it melts down easily). Pour into the pan as the kale is cooking and let the flavours of this ancient Japanese food spread into the leaves. 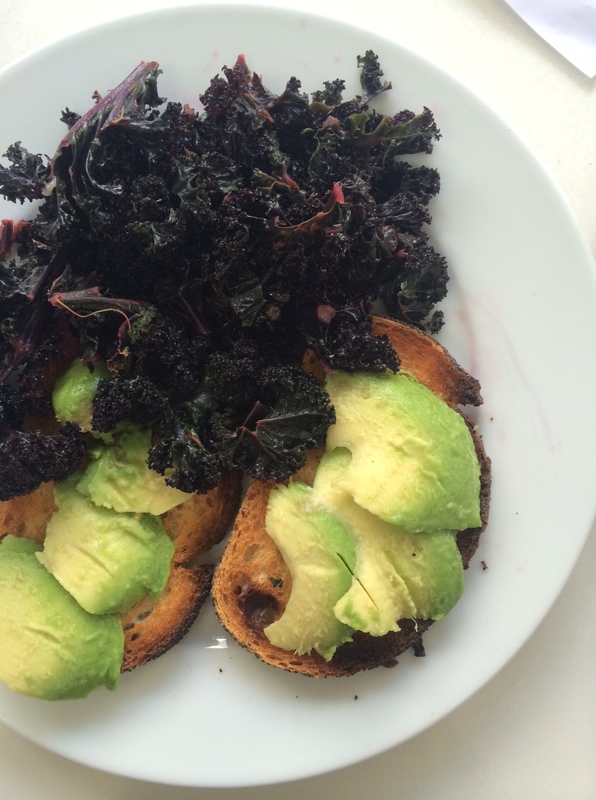 Serve your kale as a side with any dish you like – today I’ve chosen to go simple with good old avocado on toast (that powerhouse food I turn to day or night); or serve with meat if you’re not a veggie. Blend: Use a food processor to blend leaves down to a finer texture to reduce the toughness. Blend with tomatoes, parsley, nuts, olive oil, seasoning and lemon to make a delicious and colourful tabbouleh-style salad. I do this quite often. Try raw: Blend, juice or add uncooked kale to smoothies for maximum nutrients. After my adventures with raw food, reporting for Healthista.com, I’ve been experimenting with raw slaws which are super easy to make as long as you have a food processor. You simply add three salads or vegetables together with a bunch of herbs and seasoning and blend. Find organic: If you can, choose organic – probably around a £1 more than a standard bag – but because pesticides love getting into the nooks and crannies of kale’s frills, it’s always better to go organic if possible. 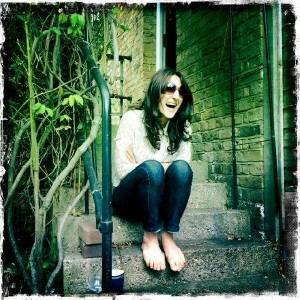 i adore kale (few recipes up) and use it in all the ways you suggest. It’s also great in a thai green curry paste. I’ve recently read that it shouldn’t be eaten raw which is quite confusing. Hey Lynda.. I’ve just quickly researched this and it seems the cholesterol-lowering enzymes may only be activated through heat, like steaming. This could be like lycopene in tomatoes and carrots which is only released through a little heat too. Some info about it here http://www.whfoods.com/genpage.php?tname=foodspice&dbid=38 I still think you would get the C and B vits and iron raw though. Great – thank you! I read somewhere that raw inhibits iodine too but I’m guessing you’d have to be consuming massive amounts. Everything in moderation even the good stuff! Interesting. Ok, seems like there are foods that contain goitrogens which can interfere with iodine absorption and impact on thyroid function (good thyroid function needs good iodine intake). When heat is applied to certain foods such as raw broccoli, kale and a few others, goitrogens become inactive. Again, you may need to eat tons to affect iodine absorption. I’m not a nutritionist of naturopath but maybe only something to consider if you have a thyroid problem. The chemical make-up of food is fascinating! It really is – so easy to forget their power of what we eat!